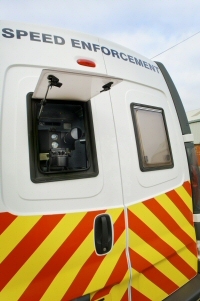 Mobile cameras are deployed from the back of an enforcement van, allowing them to be moved around the West Midlands as needed. The mobile camera vans are clearly marked to indicate that they are conducting speed enforcement and operators will place additional signing to warn of the camera and, if necessary, remind drivers of the speed limit. As a vehicle approaches, an experienced operator watches. If the vehicle is perceived to be breaking the speed limit, the camera is activated. A laser measures the speed of the vehicle. This speed is recorded onto a video of the vehicle. Mobile camera technology allows us to conduct speed enforcement on roads where a fixed housing could not be installed. The vans can also be deployed to roads where the collision history would not warrant a fixed camera, but where there is concern from the community, local authority or local police about speeding vehicles. Sites are usually visited for a matter of hours at a time and the vans move around the county's mobile sites to ensure best coverage of the road network. For more information, please visit the supplier of the mobile cameras Tele-Traffic.